The electrical storms are rarely seen in the UK. The Northern Lights were visible over the UK on Wednesday night, with people as far south as Cumbria and Northumberland spotting the solar storm. The lights are rarely seen in the UK, so many took the opportunity to photograph the display. 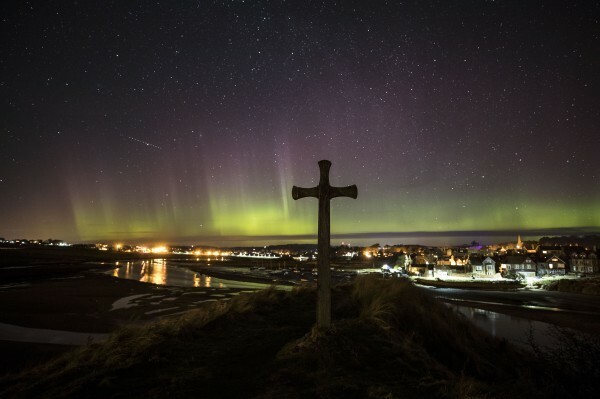 Aurora Borealis was seen over Alnmouth in Northumberland at St Cuthbert’s Cross. The same display was also spotted over Scotland. They were also seen from Cumbria. There was more cloud cover in Ireland, but they also got a pretty nice view. The Northern Lights occur when charged particles from the sun collide with gas particles in the Earth’s atmosphere, which makes them glow. The green lights seen here are caused by charged particles hitting oxygen molecules about 60 miles above the Earth. Seeing the Northern Lights in somewhere as south as the UK is rare, and is down to a particularly high quantity of charged particles coming from the sun, which are able to enter the atmosphere further from the northern magnetic pole.